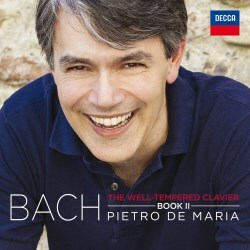 Hot on the heels of Pietro De Maria’s impressive first instalment of the Well-Tempered Clavier, which I reviewed several months ago, comes Book II, eagerly anticipated. I must confess that I have always had a slight preference for Bach’s second set, composed twenty-two years after the first, in 1744. I also have a predilection for versions played on the modern concert grand. De Maria commands a formidable technique with immaculate finish, and profound musicianship, which he places at the service of the music. These are probing accounts, all the more successful for the intelligent and well thought out choices he’s made regarding tempi, dynamics and phrasing. Everything seems convincing and works well. Far from being a sequence of dry, academic exercises, this pianist breathes new life into these richly constructed works. Ornamentation is varied, idiomatic, discreet and never obtrusive, rubato subtle and minimally applied, if at all. Pedalling is sparing in the achievement of colour and tonal shading, never at any time blurring the textures. The playing is stylish, with no unwanted accentuation. Staccato is lightly applied, and the counterpoint is teased out with clarity and definition. To get a taster of the exceptional quality of De Maria’s playing, take the Prelude and Fugue in C sharp major, BWV 872. He brings poise, elegance and simplicity to the arpeggiando character of the first part of the prelude. This contrasts with the witty humour of the fugue, realized with some crisply articulated staccato. The following Prelude in C sharp minor has a probing introspection, whilst the beautiful B flat minor Prelude, a miniature trio sonata in all but name, is ideally paced, with the polyphonic lines sensitively articulated. There’s a calm, spacious feeling to the Prelude in F major, and a nervous spikiness to the Fugue. De Maria coaxes come luscious sonorities from the piano in the Prelude in F sharp minor, evoking a mood of serenity and tranquillity. I’m enamoured by the intimate conversational tone of the D sharp minor Fugue, and the darker elements are brought home in the bold nobility of the G minor Prelude. No-one can fail to be won over by the confident exuberance and affability the pianist lavishes on the B major Prelude, and the Prelude in D minor is delivered with rhythmic buoyancy and elan. The delicacy of the G major Prelude is made all the more endearing by De Maria’s gossamer touch; this is extended to the Fugue, where the contrapuntal strands are deftly picked out. When I reviewed the first volume, I was particularly taken by the audio quality the Decca engineers had achieved. Once again, the Auditorium del Suffragio, Lucca provides a fitting venue for Book two, conferring a comfortable immediacy on the piano sound, it’s warm, intimate ambience being second-to-none; it’s generous acoustic particularly sympathetic to the contrapuntal detail of the music. Marco Vincenzi has provided some enlightening annotations in Italian with English translation. Bach’s ‘Forty-Eight’ is well-served on CD and, over the years, I have amassed quite a few cycles. There are two favorites, outstanding in my view - András Schiff’s second cycle on ECM, and the less well-known but equally distinguished traversal on Nonesuch, recorded by Edward Aldwell. I can confidently add Pietro De Maria’s compelling vision to this illustrious duo and, as was the case with his Book I, I have no hesitation in awarding this latest release a ‘Recording of the Month’.